The following Green Alert on LEDs includes information provided by BetaLED. To reduce energy consumption, HM recently upgraded one-for-one 250W metal halide (MH) fixtures with CREE® 304 Series™ luminaires in three gymnasiums. Since use of the gymnasiums varies during the school day, evening, and weekend hours, optional multi-level dimming occupancy sensors were added to provide further opportunities for decreased energy consumption. The previously-installed MH lamps had a recommended relamping service interval of 6,000 hours where the lamps would lose 25 percent of their initial lumens. This resulted in frequent lamp changes and color inconsistencies. The newly installed, CREE® LED luminaires provide near-maintenance free, reliable performance which results in dramatically reduced savings in maintenance costs and greater color consistency. 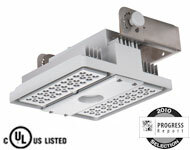 The school expects to realize an astounding 70 percent decrease in annual energy consumption and save approximately $9,500.00 in annual energy costs from the combined efficiency of the CREE® 304 Series™ luminaires and use of the occupancy dimming option. To help offset the LED luminaire investment, HM worked with the local utility company, Con-Edison, which offers incentives and rebates to commercial customers for installing high-efficiency electric equipment. The school is receiving a rebate of approximately $4,000.